Food is the major rival of the Big Game this Super Sunday. Long gone are the days of chip and dip and today’s Bowl partygoers chow down on a range of dishes from gourmet pizza to Super Bowl snack stadiums. A favorite that I like to make: The Meatball Sammich. A delicious classic that’s sure to be a crowd pleaser. Make this recipe your own by switching out marinara for BBQ sauce or adding your favorite cheese. Give it a try and post a comment on my Facebook page or tweet me at @chefaramreed #Superbowl. 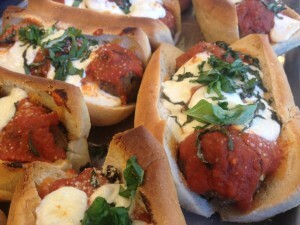 Add cooked meatballs into nice sub roll, top with your favorite marinara sauce, mozzarella and put under broiler for 2 min or until cheese is melty. Top with fresh basil and serve.